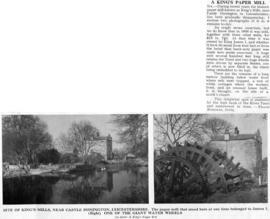 Cutting from 'Country Life' of a submission by Frank Rodgers describing the history of King's Mill in Castle Donnington. 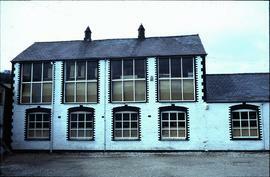 The piece mentions that the paper mill was owned by James I in 1609, and also provides details of its structure. "Afonwen Paper Mill Drying Mill"
"Austria - B&B mill, Dandy"
"Austria - B&B mill, Paper machine"
"Austria - B&B mill, steam boiler, Babcock"
"Austria - Lyken Mill, Head box of paper machine"
"Austria - Steyrermuhl rag boiler"
"Austria Lykam Mill - infra red heater"
"Austria Lykam Mill - west end of paper machine"
"Austria Lykam Mill upper wire on paper machine"
"Ayton, Scotland Paper Mill Picture"
"Batchelor's Mill, Ford Nr Ashford, Kent"
"Bath - De Montalt Papermill"
"Belgium Paper Mill - Rag boiler"